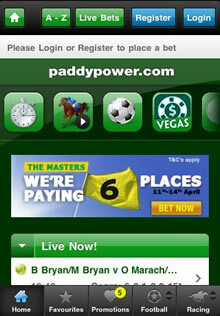 Paddy Power are one of the few bookmakers to develop a dedicated app specifically for the Blackberry operating system. The app is based on the massively successful Paddy Power Android and Apple iPhone versions. While most online bookmakers have only developed specific apps for Apple iOS and Google Android, Paddy Power has gone one step further by developing a dedicated Blackberry OS app. The Paddy Power Blackberry app has been designed with Blackberry phones and tablets in mind so expect a much smoother experience. It boasts all the same functionality as it's iPhone and Android counterparts so you won't be missing out on anything. Bet live in-running, create football coupons, check scores and much more from your BB. BONUS: Paddy Power will match new customers first bet with a free bet to the value of £50. Blackberry users also have full access to all the money back specials, promotions and offers from their mobile device. Bet365 do not have any bricks and mortar betting shops like their competitors so they have been able to focus 100% on developing the best possible online and mobile betting experience. We've rated their mobile client as #1 for both for iOS and Android devices, while their Blackberry app comes a close second to Paddy Power. 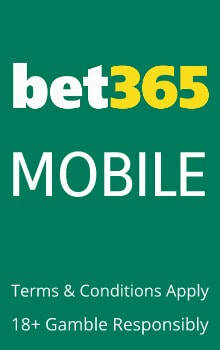 Bet365 Blackberry offers everything you could possibly need from a mobile sportsbook. You can bet on thousands of markets, study the racing form, create coupons/accumulators and check the latest scores. BetOnline (formerly BestLineSports) have been taking wagers from United States players since 1991. 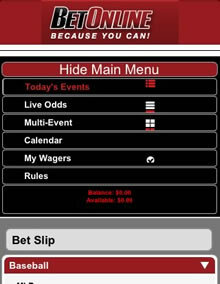 The BetOnline app does not require a download and works on all Blackberry phones and tablets. Since BetOnline is a U.S. facing mobile sportsbook, they primarily focus on baseball, football, basketball and ice jockey, although European customers are also catered for with betting lines for soccer, rugby, tennis, cricket, darts, snooker and more. BONUS: BetOnline offer a 25% free play bonus on EVERY deposit you make for life. Blackberry customers can also get a $50 free play on the first bet they place via a Blackberry. BlackBerry mobile devices may not be as popular as Android smartphones or similar Apple products, but that doesn’t mean the recent boom on the mobile sports betting market didn’t result in cool online bookmaking apps for the RIS product. In fact, quite the opposite happened as plenty of popular sites have released BlackBerry-friendly versions of their apps over the past few years. All things considered, even though BlackBerry isn’t exactly the best mobile device for online bookmaking due to limited screen real estate, the fact remains that all of the available apps do their job extremely well and can easily rival desktop-based clients in terms of functionality. As you’ve probably already guessed, the full functionality of a complete online bookmaking application in a mobile package is the biggest selling point of the BlackBerry sports betting software. Basically, the fact that unlike poker or casino games, online bookmaking doesn’t require you to make any split-second decisions as your success depend solely on your planning and sports predictions makes BlackBerry apps no different from the software designed for higher resolution platforms. Yes, the developers might’ve been forced to cut a corner or two due to hardware limitations, but in the end you’re still making the same bets using an extremely compact device. If you’re worried about the security and safety of mobile bookmaking with a BlackBerry phone, you should be happy to hear that most of the companies involved have an excellent track record when it comes to keeping your personal data and money out of harm’s way. The industry is extremely competitive, so the bar is set high when it comes to issues like transparency, banking and underage gambling. Even better, BlackBerry mobile devices tend to be significantly more secure than desktop computers, so the risk of becoming a victim of a hacking attempt is much lower. Another important advantage of mobile bookmaking with a BlackBerry device lies in the sheer number of betting options available once you register your account. The available sports include all the popular choices like soccer, basketball or American football, but if you like tennis, rugby, cricket, motor racing, auto racing, fighting sports or even college basketball or fantasy football you’re going to find what you’re looking for on any of the major sports betting sites. Aside from the standard betting services, some operators allow you to engage in live betting, which has been recently growing in popularity in the online bookmaking popularity – so if you want to give it a try, a BlackBerry phone is guaranteed to be up to the task. Finally, you have to keep in mind that there’s no single “best” mobile bookmaking site, as all sports betting companies have their pros and cons. Consequently, choosing something that will suit your taste might seem to be a daunting task. Thankfully with the help of the reviews available on this site, you’ll be able to familiarize yourself with all the popular choices, which will hopefully help you avoid going through the frustrating trial and error phase when making your pick.